Well, this isn’t the prettiest dish to look at it and the sauce, before you blend it up a bit, looks pretty suspect with all the curds floating around in the braising liquid but man, that pork was tender. I knew I was on to something when Jack and Charlie started laughing when I told them what was for dinner and they looked at each other and said, at the same time, ‘milk steak’ and started laughing even harder. Turns out, they were referring to a scene from It’s Always Sunny in Philadelphia where Charlie is answering questions for his Match.com profile and ‘milk steak’ is his favorite meal. Honestly, I don’t really understand why they thought the milk steak thing was as funny as they did but I’ll take it. I mean, how often does your dinner cause uproarious laughter?? Season pork generously with salt all over. Let sit at room temperature at least 1 hour, or preferably chill overnight, then let sit at room temperature 1 hour before cooking. Preheat oven to 300°. Heat oil in a large Dutch oven over medium-high heat and add garlic, cut sides down. Cook until golden brown, about 1 minute. Transfer garlic to a plate. Add pork to pot and cook, undisturbed, until golden brown, 3–5 minutes. Turn and cook, reducing heat to medium if needed so it doesn't burn, until golden brown on all sides, another 3–5 minutes. Remove the pork and add the onion to the pan. Sauté the onions until they are softened and light brown, about 10 minutes. Return pork and garlic to pot. Add milk, sage, chiles, and lemon peel. Transfer pot to oven and bake, uncovered, turning pork every 30 minutes, until meat is very tender and can easily be pierced with a paring knife and milk has reduced and formed curds, 2½–3 hours. Transfer meat to a cutting board, cover, and let rest. 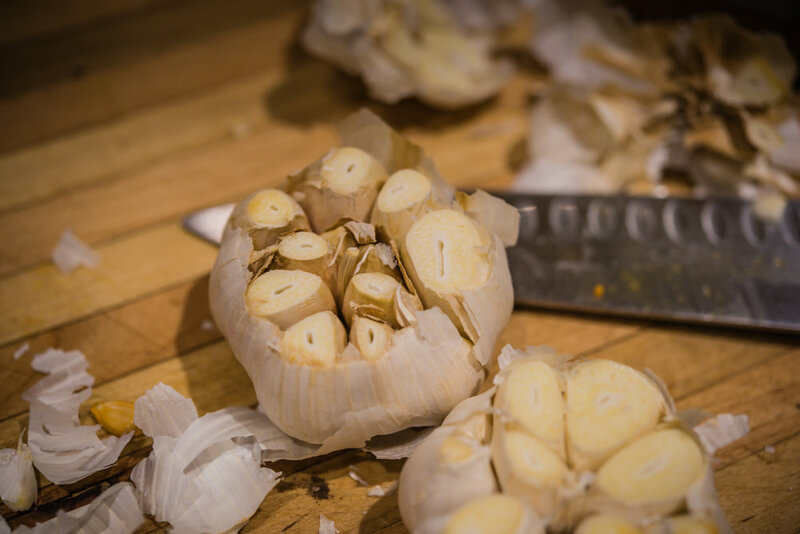 While the meat is resting, remove the heads of garlic from the pot and set aside. Remove the lemon peels and half of the sage and discard. Remove as much the fat from the braising liquid as possible, using a spoon or a fat separator, and then carefully pour the braising liquid into a blender to combine (and incorporate the milk curds into the sauce). Place the sauce in a wide and shallow sauce pan and cook over medium heat for about 10 minutes, or until slightly thickened. Slice pork and transfer to a platter. Arrange roasted garlic alongside pork, if desired. Spoon sauce over and season with salt and pepper.